Carpet is one of the best flooring materials for indoor floors. It is affordable and available in various designs, colors, and textures. As a flooring material, carpets provide warmth during the winter season, offer comfort and cushion, and serve as a good sound insulator. Safety is also enhanced when you have carpet flooring since slip-and-fall accidents are avoided. Carpets are also effective in capturing dust, allergens, and other contaminants that may pose health risks to you and your family. If you want to enjoy these benefits, install a new carpet in your home or office. But make sure that this type of floor covering is installed by expert people. At Moriarty Floor Covering, Inc., we can help you with all your carpet flooring needs. We maintain a huge inventory of top-quality carpets from reputable brands. Our partnerships with leading carpet manufacturers in the country allow us to provide clients like you with your desired brand, type, and design. You will also enjoy our highly personalized installation service. We can assist you in carpet selection, budgeting, and installation. Our crews are all professionals and dedicated to providing first-rate services for all our clients. We've proven this to countless residential and commercial clients from Bloomington, Kirby, Harrodsburg, Unionville, Ellettsville, Cincinnati, Whitehall, Hendricksville, Bedford, and Springville, IN. Call (812) 824-5555 today. The longevity of your carpet flooring largely depends on the build quality of your chosen product. If you want to be assured of a durable and long-lasting floor covering, use carpets from reputable brands. Some of the leading manufacturers that you can trust include Shaw, Dream Weaver, American Carpet, Lexmark Collection, and Mohawk. They offer premium-quality carpets, which are available in exciting design options. About 65 percent of carpet materials sold in the US are made from nylon. This material is a good option because it is durable, easy to clean, resistant to mold and mildew, and capable of enduring the stress in high-traffic areas. However, there are other available materials that are also durable and attractive. Your other options include cotton, acrylic, polyester, polypropylene or olefin, and wool. You have to ensure that the design and type of carpet flooring will match with your interior decor. 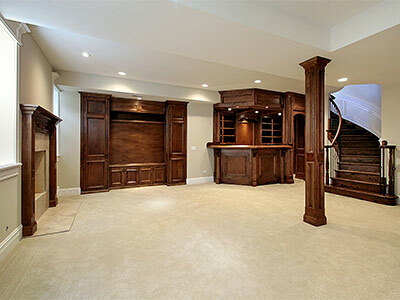 Your flooring project will be successful if you choose a well-experienced carpet flooring installer. He or she can guarantee the outstanding installation of your carpets by using appropriate tools and methods. In addition, look for certified or accredited installers since they are trained by suppliers in the proper installation of their products. You will also get full product warranty and after-sales service. Please call or visit our shop today so we can help you choose the right type of carpet flooring for your home or business.